With the arrival of the X-Pro2 at the beginning of the year, speculation instantly switched to when we'd see an update to the X-T1. 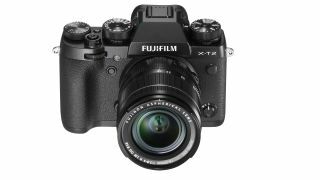 With various leaks over the past couple of months, Fuji's now officially taken the wraps off the X-T2. While at first glance it may appear that very little has changed from the images you see here compared to the X-T1, they mask numerous changes that could make a camera that's already a firm favourite with us here at TechRadar, even better. Let's take a look at some of the key things you to get you up to speed on the X-T2. Autofocus promises to be dramatically improved, with a total of 325 AF points, Zone focusing points increased to 91 from 49 and 40% of the imaging area covered with phase detection AF pixels. The X-Processor Pro image engine uses improved algorithms that sees the X-T2 refocus more frequently for better predictive AF and accuracy, even down to -3EV (darker the moonlight). As well as this, the AF-C algorithm has been enhanced when focus-tracking moving subjects, with users able to choose individual settings for Subject Retention, Acceleration / Deceleration Tracking and Focus Zone characteristics, or select one of 5 presets. The X-T2 is the second camera after the X-Pro2 to use Fuji's latest 24.3Mp X-Trans CMOS III APS-C sensor, with an ISO range from 200-12,800 (expandable to 100-51,200, JPEG only), while there are a host of Film Simulation modes included as well, including the latest ACROS mode for rich, mono images. The design follows the X-T1, but with a host of tweaks and changes. As you'd expect, it remains sealed against dust and moisture, with 63 weather-sealed points round the body, but key changes include a Focus Lever to quickly select the AF point, a larger handgrip, a three-directional tilting display (it tilts up and down when shooting in landscape, and upward when shooting in portrait), dual SDXC UHS-II card slots and redesigned lock and release dials for quicker operation. The first X-series camera to support 4K video capture, with a high 100Mbps bitrate and the ability to apply Fuji's Film Simulation modes. The X-T2 supports Clean HDMI output for 4K video recording, as well as 'F-Log' log-gamma option for video production workflow. The X-T2 also features a 3.5mm microphone connection (there's a 3.5mm headphone connection on the new VPB-XT2 vertical grip). The optional VPD-XT2 vertical grip holds two batteries, and in Boost mode, multiple batteries can operate at the same time to give a boost to camera performance in continuous shooting (up from 8fps to 11fps), shooting interval, shutter release time lag and blackout time, while also extending the duration of 4K video recording to approx. 30 minutes. Also announced alongside the X-T2 is the EF-X500 flashgun. Though the X-T2 comes bundled with a small-output flash, the EF-X500 has quite a bit more kick, with a Guide Number of 50 (at ISO 100), with a zooming feature covering focal lengths from 24-105mm. The design is both dust and weather resistant, with the flash head able to be tilted up by 90 degrees, down by 10 degrees, to the left by 135 degrees and to the right by 180 degrees to deliver a range of options for bounce lighting. Wireless flash control is also possible, with the EF-X500 offering the ability to control multiple compatible flashguns. Expected to be available from September 8th, body only price has been confirmed at £1399 ($1599.95), with a kit available that includes the XF 18-55mm f/2.8-4 R LM OIS standard zoom lens at £1649 ($1899.95). The VPD-XT2 battery grip will be priced at £299 (US pricing still to be confirmed), with the EF-X500 flashgun priced at £449.99 ($449.99).